Few days before I wrote about creating a Docker Swarm Visualizer here. I have enjoyed very much writing that peice of software. However, I wanted to have a more funny way to look at the cluster. Therefore, last weekend I thought of creating a 3D viewer of the cluster that might run on a large screen, realtime showing up the machines and their workloads. After hacking a little bit, I ended up creating a 3D perspective of the Docker swarm cluster, that shows the nodes (workers in green, managers in blue and drained nodes in red colors and micro service containers in blue small cubes, all in real-time and by leveraging the ThreeJS library. It was just an added funny view to the existing visualizer. Hope you will like it! You need to rebuild the docker image from the docker file in order to have the 3d view enabled. I didn’t want to include this into the moimhossain/viswarm image. A visual representation facilitates understanding any complex system design. Running micro-services on a cluster is no exception. Since I am involved in running and operating containers in Docker swarm cluster, I often wonder how better I could be on top of the container tasks distribution is taking place at any given moment, their health, the health of the machine underneath etc. I have found the docker-swarm-visualizer in GitHub – which does a nice job in visualizing the nodes and tasks graphically. But I was thriving to associate a little more information (i.e. image, ports, node’s IP address etc.) to the visualization. Which could help me take the follow up actions as needed. Which led me writing a swarm visualizer that does fulfil my wishes. Here’s video glimpse for inspirations. Real time updates when nodes added, removed, drained, failed etc. Real time updates when services created, updated, replications changed. Real time updates when task added, removed etc. Alert on crucial events like node drain, service down etc. The application written with Express 4 on Node JS. React-Redux for user interface. Docker Remote API’s are sitting behind proxy with a Node API on top, which better prevents exposing Docker API – when IPv6 used. If you are playing with Docker swarm clusters and reading this, I insist, give it a go, you might like it as well. And of course, it’s in GitHub, waiting for helping hands to take to the next level. The cluster management and orchestration features embedded in the Docker Engine are built using SwarmKit. Docker engines participating in a cluster are running in swarm mode. You enable swarm mode for an engine by either initializing a swarm or joining an existing swarm. A swarm is a cluster of Docker engines, or nodes, where you deploy services. The Docker Engine CLI and API include commands to manage swarm nodes (e.g., add or remove nodes), and deploy and orchestrate services across the swarm. I was recently trying to come up with a script that generates the docker swarm cluster – ready to take container work loads on Microsoft Azure. I thought, Azure Container Service (ACS) should already have supported that. However, I figured, that’s not the case. Azure doesn’t support docker swarm mode in ACS yet – at least as of today (25th July 2017). Which forced me to come up with my own RM template that does the help. A load balancer (with public port that round-robins to the 3 VMs on port 80. And allows inbound NAT to the 3 machine via port 5000, 5001 and 5002 to ssh port 22). Configures 3 VMs as docker swarm mode manager. 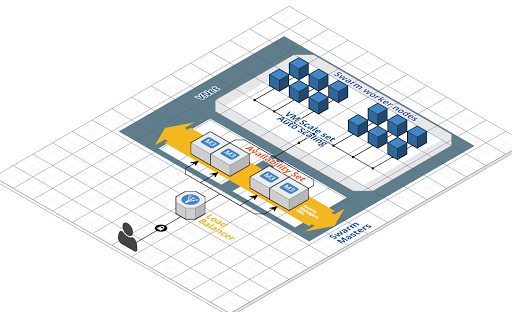 A Virtual machine scale set (VMSS) in the same VNET. 3 Nodes that are joined as worker into the above swarm. There’s a handly powershell that can help automate provisioing this resources. But you can also just click the “Deploy to Azure” button below. The entire scripts can be found into this GitHub repo. Feel free to use – as needed!